The Digital Marketing Solutions Summit is the UK’s largest gathering of empowered and active managers and buyers from across the sector, all looking for the connections, insight, products and technology to take their business to the next level. 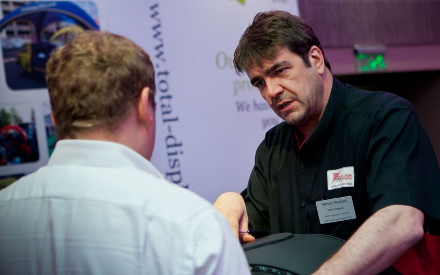 All delegates have proactively registered to attend and are committed to looking for new solutions and suppliers. They are coming to have meetings and do business. There are no time wasters, no tyre kickers – and no one’s here for the free coffee. Our guarantee to you is that we will maximise your valuable time in what could and should be the most productive and rewarding day of the working year. Your package will include your appointment schedule, stand with electrics, furniture and name board, meals and refreshments, WiFi and detailed information on attending delegates. Your company logo and information will also be included on email, website and social media marketing for the event. What will my stand look like? We supply you with a stand made up of 3 panels (one at the back and one on each side), each measuring 36in (914.4mm) wide and 84in (2133.6mm) high. You cannot bring your own modular stand or portable display units. You can affix posters etc. with Velcro, and the name of your company will be displayed at the top of the middle panel (8” x 31.5”). The focus of the event and face-to-face format is the pre-arranged meeting schedule. With this in mind, any additional marketing material to dress your stand (as explained in the question above) and that you wish to give to delegates is at your discretion. You will be provided with electrics to charge any laptops/tablets and will be supplied with an event information pack at registration, detailing delegate contact details and information (with space for making notes). How do I know who is attending the event? You will be updated periodically on attending delegates, from the time of confirming your place, right up until the event itself. In the run up to the event, you will be sent login information for our online pre-event selection process. From here, you will be able to confirm your details, shortlist and prioritise delegates you would like to meet at the event, add information on the representatives attending the event (including dietary or accessibility requirements) and review and submit all of your information. How much work is there before the event? What happens if no one selects me? It is unlikely that you will not be selected by any delegates, as we work with an active delegate analysis to ensure that participating suppliers cover the products and services of interest to delegates. The dress code during the day is business attire.